Let's explore leaves and trees! On each of my free lesson planning pages you can find a free sample lesson plan, Pre-K Printable Fun products related to the theme, suggestions for your Dramatic Play/Construction centers, book selections, inspiration from our FB Community and recommended activities from around the web. See how our customers are using leaf and tree activities from Pre-K Printable Fun products in their programs. These can be purchased in my shop-Save more with a Pre-K Printables Club Membership! Find out more! 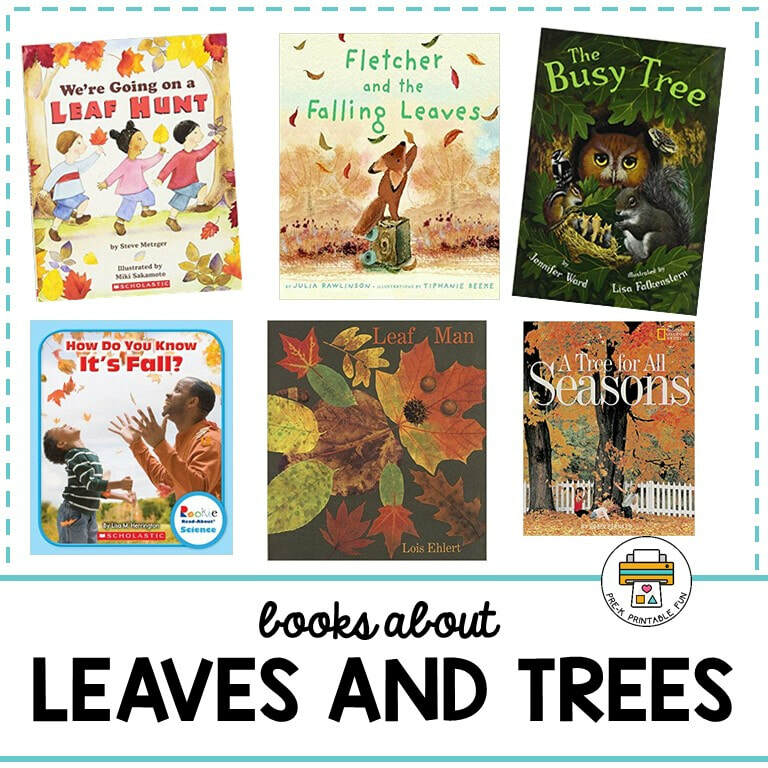 Add some leaf decor and books about leaves and trees to your space. Pull out leaf/tree puzzles. If you have incorporated a tree into your space-change out your "Summer" leaves into "Fall ones. If you plan on adding a tree to your space, consider adding velcro, so that the children can change out the leaves seasonally. Dramatic Play: Add a "raking center" in your dramatic play space (you can purchase silk leaves at your Dollar Store or local craft store). Add some plastic rakes and a strip of indoor/outdoor carpet for a fun effect. Construction/Building Area: Encourage kids to create trees for the construction space. Provide them with a variety of recycled items to turn into small trees. You can purchase or paint your own "tree" blocks for this space as well. silk leaves from the dollar tree. Arts & Crafts Provide your preschoolers with a variety of fall colored play dough this week. Add Tree and Leaf cookie cutters to the art space. You can add Leaf Rubbings and Small twigs and leaves (both real, and paper/silk) to this space as well, and encourage them to incorporate them in their free art. These coffee filter leaves belong to Daycare Spaces and Ideas member Darlene Santos Gormly. The Children used Coffee Filter leaves (that she cut out herself), eye droppers, and Red & Yellow watercolor paints to create these beauties. vellum on their light table to practice their counting skills. You can turn silk leaves into "Felt Board" activities, or add them to your Sensory Table for some fall fun. You can also turn simple Bulletin Board Leaf Cut-outs into a matching game (if you are unable to procure a variety of leaves in your neighborhood). This Fall Tree Number Matching activity-from Mom Inspired Life is a clever way to incorporate number recognition into your week. Community member Laurie Cheney shared this lovely photo! There is something magical about raking fall leaves on a crisp fall morning into a big pile-and of course jumping into them. A parachute + Leaves = tons of outdoor fall fun. Check out this activity and other fun fall ideas from Teach Preschool.